Fitness zone features side entry steps with sculpted massage seat, open barrier-free fitness area, two RX6™ standing massage columns. Hot tub zone is a full featured 5 deep seat spa. Separate zones with filtration, heating, therapy and fitness action controls. 49 hydrotherapy stainless Reflections Jets™ . Full body massage columns. Shoulder, upper and lower back, and hips in 6 seats. Swim Spa and Hot Tub in One! 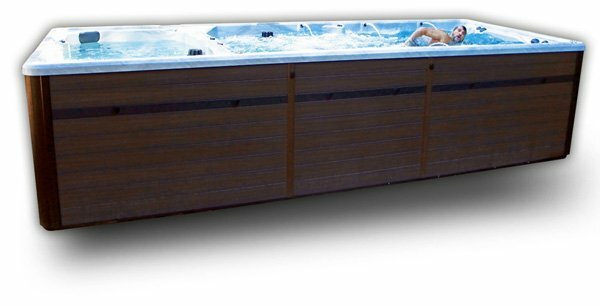 The dual zone FX219s offers a full featured 5 seat hot tub and a spacious swim spa in one unit! You decide to operate both zones at once, or only the hot tub or only the swim spa depending on the season and your lifestyle. Side entry steps assure an open barrier-free fitness space measuring an impressive 118”. Swim, run, jog, lift weights or just simply relax under a starry sky. There is something for everyone in this multi-use dual zone swim spa.